Are you trying to find the best embossing machine? Whether as a hobby or a business, crafting can be very enjoyable and soothing. Embossing is sort of a meditative process for many, as it lets you relax and unleash your creativity to create unique designs. And if you can make some money while you’re at it, it’s certainly worth the effort. To make sure the whole experience is enjoyable and doesn’t constrain your imagination, you need the best embossing machine that you can get your hands on. To help you find the right one, we’ve created this guide where you’ll learn about the characteristics of capable embossing machines. But first, let’s take a look at some of the best embossers that the market has to offer. How to Choose the Right Emboss Machine for You! In our buyers guide, we will focus on finding a fabulous paper embossing machine or maybe even a card embossing machine. We suggest you check out our comparison chart and then read our reviews of the machines that best suit your requirements. Below is a comparison chart of all the top embossing machines, which are mentioned in this article. You can then read my reviews below featuring the best embossing machine 2019 has to offer. Find below some guidelines to follow in order to help find the best embossing machine for your needs. Now that you’ve seen some of the best embossing machines, it’s time to dig a bit deeper into all the factors that we took into consideration in coming up with our top picks. Embossing machines let you create all kinds of patterns on various materials. You get two folders, one embossed and one debossed. Make a ‘sandwich’ of the two and the material that you put between them will be embossed with the pattern of your choice. A lot of manual die cutting machines are also fabulous as an embossing tool. People use an embossing machine for card making, scrapbooking, home décor, and all kinds of other uses. Most embossers can also cut shapes with the use of dies, which means you can also create boxes, embellishments and so muc more. Versatility relates to both materials that you can use and the size of said materials that you can put in the machine. A good embossing machine for your needs should be able to let you work with materials such as fabric, felt, foam, cardboard, and leather. Embossing machines also have different-sized plates to fit the opening, so figure out your maximum embossing sizes. You can use a big embossing machine to emboss something smaller but you can’t do that the other way round. For example, the Sizzix Big Shot Pro can let you emboss on anything from coasters to full-sized bags. It is also a fabulous metal embossing as well. On the other hand, the Evolution Advanced will have more limited uses. 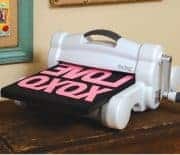 The bottom line is, if you’re passionate about embossing and plan on working on many projects in the future, you’ll be better off with a larger embossing machine. A machine that has a larger opening will most probably be larger in size and cost as well. Embossing machines have a lot of moving parts and accessories. This is why lower-quality machines might be prone to breaking. It’s always a good idea to invest a bit more into a high-quality embossing machine than to end up having to replace it within a year or so. Generally, you will get what you pay for with embossing machines. Reputable brands price their machines a bit higher, but they’re a safer bet than cheap machines by unknown brands. Most of the embossing machines on our list are manual. This doesn’t necessarily mean that people prefer to do everything by hand. It’s just the fact that hand embossing machine are more affordable. For example, if you want a machine that has a 12” or larger opening, the necessary motor might be as big and expensive as the machine itself. 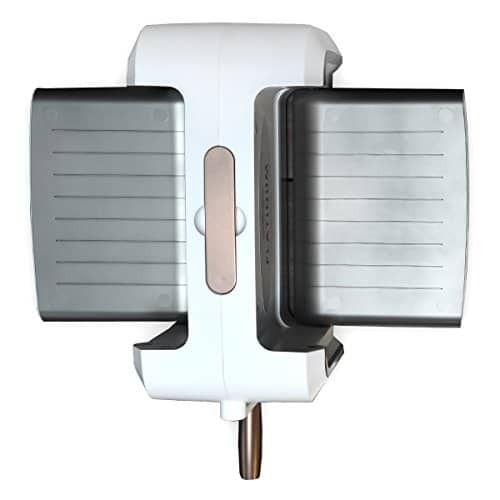 Of course, there are also plenty of electric embossing machines for you to choose from. They’re usually more convenient and can save you a lot of time if you’re doing this for work. On the other hand, it might take less time to configure and work a manual than an electric embosser, so unless you already have some experience with it works – getting everything aligned and proper and stuff – you might be better off with a manual machine to start. Many people may not worry about portability until it stares them in the face. Of course, this isn’t going to be important to everyone, but you should think about it before you make your final decision. Portability and size/power often don’t go hand-in-hand, so you’ll always have to sacrifice one for the other to some extent. However, it is possible to find a good balance between the two – just make sure to check the dimensions of the machine before you buy it. Even though this is entirely subjective, the main rule to follow when it comes to your budget is to think about the features that you really need. For example, beginners won’t need a machine that does it all. What if you spent $400 on something that you end up not using after a while? It’s always better to start small and upgrade as you explore different options, unless if you’re starting an embossing business or something along that line. Below you will find the best card and paper embosser machines. I will outline the top features, the pros and cons of each in detailed embossed printing machine reviews, which should help you choose the best machine 2019 has on offer. Before we get started, I wanted to include a note in here about the popular Cuttlebug machine. 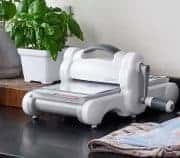 Whilst the Cuttlebug embossing machine has been super popular, Cricut has released a press release to notify us that this machine is now discontinued. Also, you might like to visit our die cutting machine review guide, as most of the machines listed below are both cutting and embossing machine in one machine. 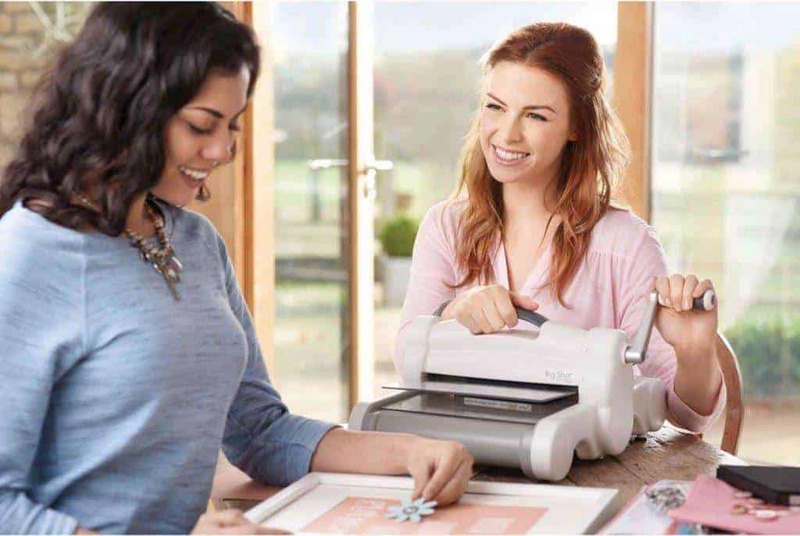 Sizzix is one of the biggest names in the world of embossing, die cutting, and such crafts, so expect to see more Sizzix products on our list. As for the Big Shot Pro, it truly lives up to its name. It’s easily the most capable embossing machine that you can get without sacrificing a limb, a great choice for many creative people. Of course, this doesn’t make it perfect, so keep reading to see if it’s for you. This is one of the most capable Sizzix embossing machines out there. It can emboss on a very wide variety of materials of up to 12” wide. It’s highly versatile and powerful enough to allow you to emboss everything from paper to strong leather. As a manual option, it’s quite easy to use. Even if you’re a beginner, you should master it in no time. However, the machine is perhaps more suitable for pros, and it can hold its own in industrial use. With that in mind, it offers great value for your money compared to the costs of industrial machines. You can create cards, home décor, invitations, fashion garments, and many other forms of art. 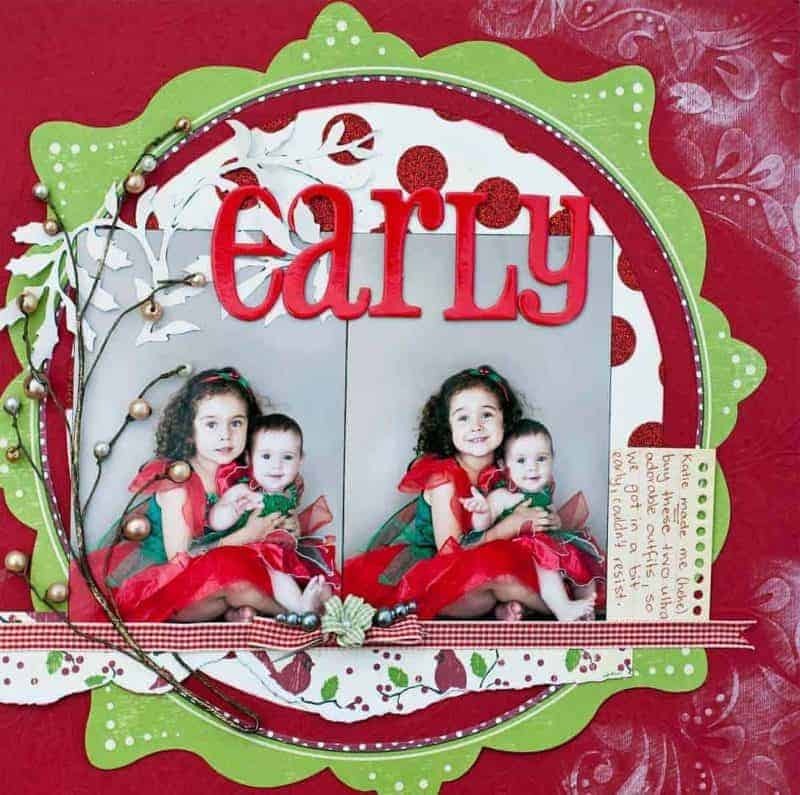 It’s compatible with all products in the Sizzix library, including Framelits dies, Textured Impressions, Impresslits Embossing Folders, and Texture Fades. The Extended Adapter Pad ensures that all Sizzix steel-rule dies are compatible with the machine. However, you might have to buy additional accessories to make the sandwich required for certain types of embossing work. Considering the relatively high investment for a Big Shot Pro, this is quite a drawback. 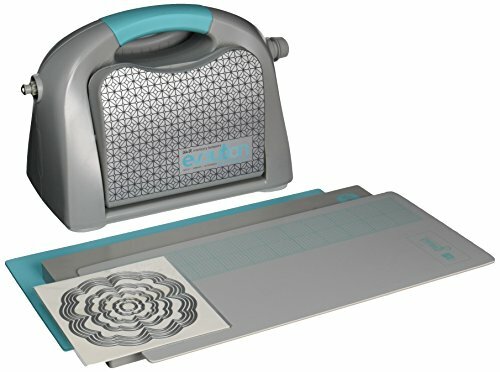 In addition, if you want to do some embossing on the go, this machine is far from the best choice. It’s pretty bulky at 24.25" x 15" x 7.5". In addition, it weighs almost 44 pounds. But you could have guessed that Sizzix didn’t make this one with portability in mind. You can see why it’s suitable for industrial use and more experienced embossers. Despite a few inconsequential drawbacks, it’s a highly capable machine. You can hardly go wrong with it. >>> ​CLICK BUTTON BELOW TO SEE CURRENT PRICES. 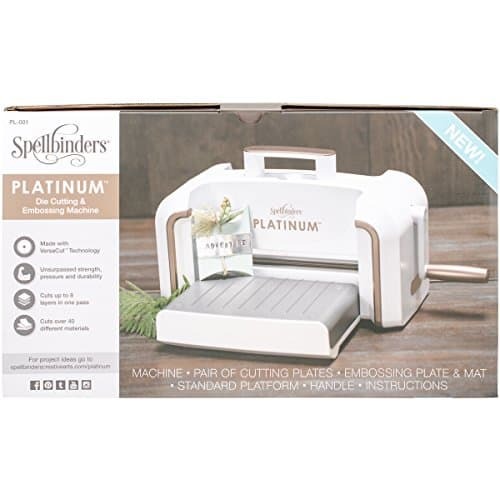 If you’re looking for a good, affordable embossing machine, the Spellbinders Platinum can be a great choice. It’s suitable for both beginners and more serious embossers thanks to its capability and versatility. If you can live with a few limitations, this one might fit your needs quite well. The Platinum features a sleek modern design and packs quite a bit of power despite its rather fragile appearance. The overall performance is good enough for most average users, as it allows you to cut and emboss on more than 40 different materials. In addition, it’s strong enough to cut through 6-8 layers of various materials. 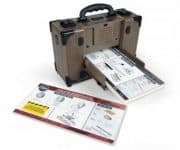 What makes it even more versatile is its compatibility with embossing folders, plates, and other accessories (cross compatible with other brands). The ability to work with cheaper accessories outshines far more expensive embossing machines. On the other hand, the biggest drawback is the platform size, as you might expect at this price. With 8.5” of space, it’s a bit more limited in this sense. Still, it’s wide enough to let you create all kinds of crafts, as long as you don’t exceed its width. 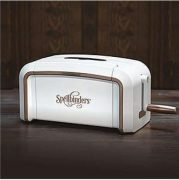 At 16” x 10” x 12 and 22 pounds, the Spellbinders Platinum is a relatively compact and lightweight embossing machine. We’re not saying that it’s the most portable machine out there. You always have to weigh printable areas and size/weight in this regard. A tiny machine is going to print tiny areas. Users have also complained about the plate size. Even though the machine offers an 8.5” x 12” platform, it ships with 6” x 8” plates. This means that you may have to spend a few more bucks if you need bigger plates. ​>>> CLICK BUTTON BELOW TO BUY NOW. 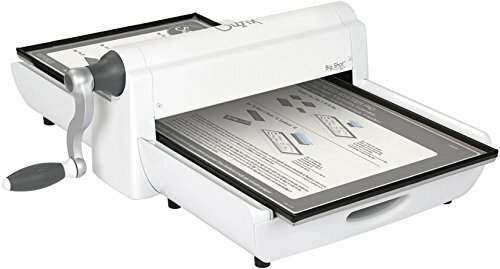 The original Sizzix Big Shot embossing machine is lightweight and compact. It’s great for beginners just like the Big Shot Pro is great for more advanced users. It offers decent performance that should satisfy the needs of more experienced users. The Big Shot is primarily made for those who want a decent machine without having to splurge. It’s a very versatile embosser that lets you work on different materials, including some rather tough materials. It can cut through 6-8 layers of standard materials, making it a great option for those who like to switch things up from time to time. 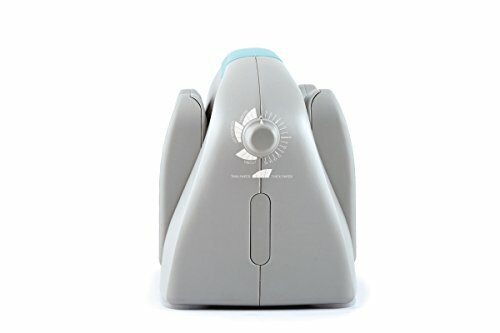 The machine features a sleek design but the quality isn’t all that great. Users have complained about parts coming loose after some time, so you might not want to rely on this one for heavy-duty embossing. In all fairness, it’s among the cheapest embossing machines that you can get, so it’s not like you can expect premium quality here. 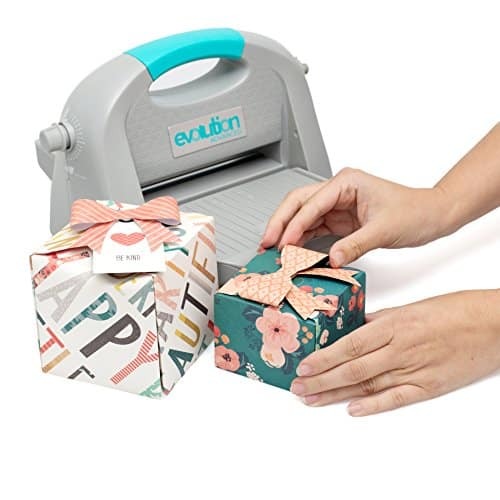 Everyone that doesn’t plan on keeping their embossing machine in one place will be happy to hear that it is quite portable. It measures 14-1/4" x 12-3/8" x 6-5/8" and weighs around 11 pounds. Carrying it around won’t be an issue so you can take your hobby with you on the road. Now, there’s one issue that seems to be universal in all Sizzix machines, and that’s the fact that they are not compatible with other brands of accessories. You get the cutting pads and a 6” platform in the package. For anything else, you might have to buy all the other accessories straight from Sizzix. In addition, the 6-inch platform can be quite limiting, which is why the machine is most suitable for smaller projects. However, note that the Big Shot does come in bigger sizes and in packages that include useful accessories. The S﻿izzix 660425 ﻿B﻿ig ﻿S﻿hot is a great little embossing machine and it is especially fabulous for card-makers. 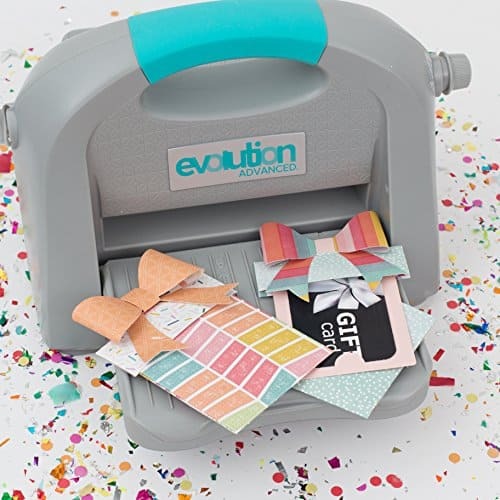 If you’re looking for an entry-level embossing machine that’s suitable for light or occasional work, the Evolution Advanced by We R Memory Keepers might give you what you need. It doesn’t have any over-the-top features, but it’s great as a starter machine to embossing. 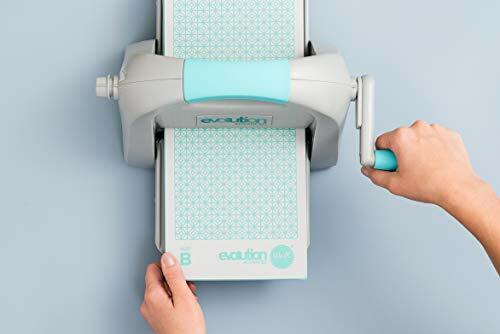 At first glance, the Evolution Advanced looks like a kid’s toy compared to more serious embossing machines. But don’t let its looks fool you, as this machine offers good performance for the price. Sure, it’s not the most powerful option out there, but it doesn’t pretend to be a powerhouse. It’s more a paper embossing machine than anything else, although it does let you work on slightly tougher materials. As long as you don’t expect an incredible performance, the Evolution Advanced should be good enough to satisfy your needs. As you might expect at this price range, this is a manual embossing machine. But there’s a twist. 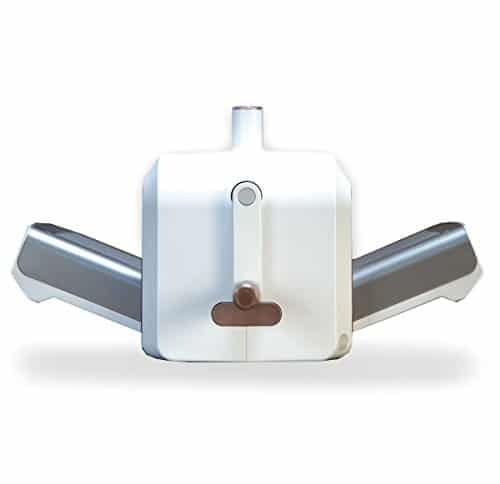 Instead of a handle, you can switch to automatic operation by engaging the optional motor. If you don’t want to do everything by hand, this machine can be a good option. You will, however, have to buy the motor separately, which you might end up doing since this is one of the machine’s main selling points. Another plus point is its portability. It measures 17.2” x 11.5” x 9.2” and weighs around 10 pounds. Aside from this, you can see that the machine is made for traveling by its design. It folds up to the shape of a small hard handbag and the top handle makes it very convenient to carry with you. The small footprint does carry some limitations, though. You can’t use any material that’s wider than 6”. But again, this machine is aimed at those who don’t really need to emboss large areas in the first place. >>> CLICK BUTTON BELOW TO BUY NOW. However, there’s also a possibility that you might think it’s trying too hard. Let’s find out. The first thing that you’ll notice about the Vagabond 2 is its design. 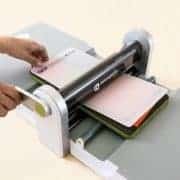 The briefcase-like machine has the same concept as other folding embossing machines, but it’s ‘different,’ so chances are you might think that Sizzix really did an amazing job here. Also, this is the limited edition Tim Holtz signature version. You know what to do if you’re a fan of the designer and crafter. Of course, it’s not all about the looks. As far as performance goes, this is a mid-range machine that should work well a variety of users. What you might find appealing is that this is an electric embossing machine. 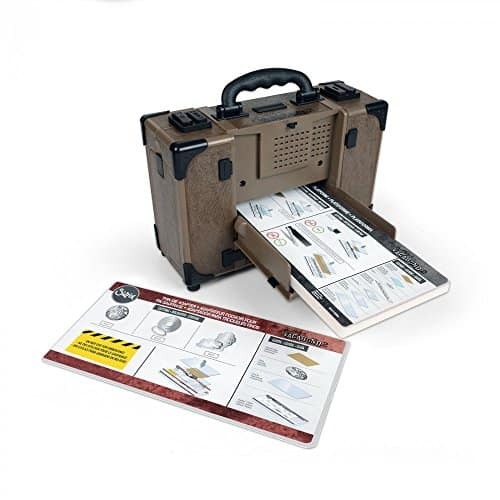 Even though it’s versatile with respect to the variety of compatible materials, it has a small 6” opening and plate. In addition, you have to buy the embossing folders separately. 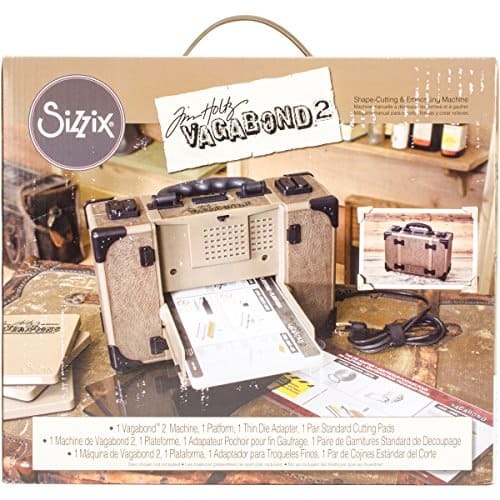 Overall, the Sizzix Vagabond 2 is a good option for average users looking for a high-quality and durable embossing machine. We’ve shown you some of the bestselling embossing machines out there and explained what to look for. Now it’s time to announce the best of the best. Based on the factors listed in the buyer’s guide, the Sizzix Big Shot Pro is the best embossing machine. It’s not the cheapest, but it’s affordable enough offers the power and versatility that will make sure you can create anything you can think of. With its big plate, high build quality, and embossing strength, the sky is the limit with the Big Shot Pro. Of course, as mentioned, it’s most suitable for average to heavy users. If this isn’t you, We R Memory Keepers’ Evolution Advanced can be a great place to start, it’s affordable and lightweight and works well enough to let you explore your interest in embossing.